Download a free soundfont player for Mac ! Download a free soundfont player for Mac & use your soundfont directly in Protools ! I have a great news today. I made an article some months ago to help people read their SF2 libraries for free on Mac because it was quite complicated to do so when you didn't know how to do. At that time there was no free soundfont player for Protools on Mac so you had to convert SF2 to NKI and then import the converted files in Structure free. Now all this is over ! You can import directly you SF2 banks in Protools, how good that sounds ? YEAH ! for FREE ! Some nice developers have decided to release a free soundfont player for the audio community ! And it's really nice. You won't have to mess with a SF2 to SFZ converter plus a SFZ reader. All is already included. The plugin is called sforzando and is made by Plogue (the guys behind Bidule). The good thing is that's it's available for VTS, AU, RTAS and standalone version (that means a Protools version YES). sforzando is a Free SFZ Player. Example SFZ FileThe SFZ Format is widely accepted as the open standard to define the behavior of a musical instrument from a bare set of sound recordings. Being a royalty-free format, any developer can create, use and distribute SFZ files and players for either free or commercial purposes. So when looking for flexibility and portability, SFZ is the obvious choice. 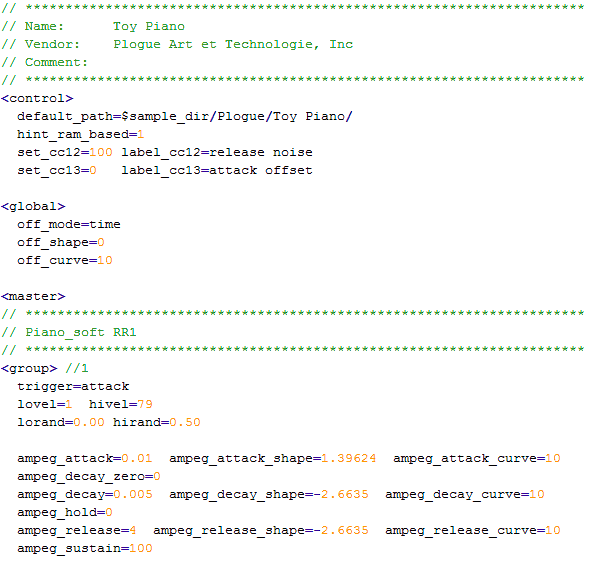 That’s why it’s the default instrument file format used in the ARIA Engine. As a bonus, an integrated format converter should get you started! sforzando relies on the same ARIA Engine that powers the ARIA Player and other products from Garritan and obviously Plogue chipsounds. This engine has been built from the “ground up” on the SFZ spec, and not as an afterthought. Like the other ARIA products, this player is available as a standalone and VSTi/AU/RTAS plugin on Windows or OS X and can run in either 32bit or 64bit. Go from free soundfont player for Mac to Home ?